Earthwork, or Land Art, has been a focus of numerous artists for centuries but has really taken a hold in the United States since the late 1960s. Earthwork is a genre of sculpture just like wood sculpture or metal sculpture; however, earthworks are constructed of natural, earthen materials such as dirt, stone, and leaves. Earthworks are created to exist and interact with the surrounding landscape. Some famous land artists include Robert Smithson, Michael Heizer, Andy Goldsworthy, Richard Long, Chris Drury, and Herbert Bayer. My earthwork, entitled Earth Circle, is approximately four feet tall and thirty feet in diameter (twenty-two feet from brick to brick). It is composed of soil, grass, and brick. The grass mound holds automatic associations with Native American burials. Rather than simply mimicking these ancient burial grounds, I altered the shape to a circular form with a six foot entryway. The beveled mound on either side of the entrance makes the sculpture more inviting and draws the viewer into the center of the circle. This provides a sculpture that is not only viewed in the round, but also from the inside out. The size of the piece allows for a certain interaction that would not be possible on a smaller scale. 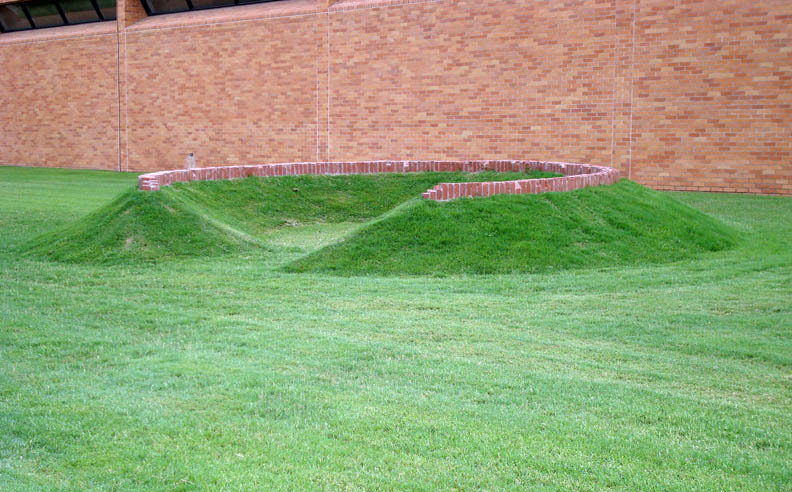 The minimalist design of the circular grass mound is enhanced by its contrast with the linear nature of the red brick that seems to grow from the top of the mound. Earth Circle attracts the viewer’s attention from afar, draws the viewer in for closer examination, and invites the viewer inside a sort of refuge to sit and contemplate.